WASHINGTON, Oct. 30 (Yonhap) -- South Korea and the United States have agreed to launch a working group to improve coordination on their joint approach to North Korea, the U.S. State Department said Tuesday. The agreement was reached during a trip to Seoul this week by U.S. Special Representative for North Korea Stephen Biegun, according to the department's deputy spokesperson, Robert Palladino. The announcement comes amid a perceived rift in the allies' approach to North Korea. Seoul has been pushing cross-border projects with the North in a bid to spur the denuclearization of the regime, but Washington has appeared concerned about the possible undermining of sanctions on Pyongyang. The purpose of Biegun's visit to Seoul was to discuss diplomatic efforts to achieve the "final, fully verified" denuclearization of North K orea, Palladino said. 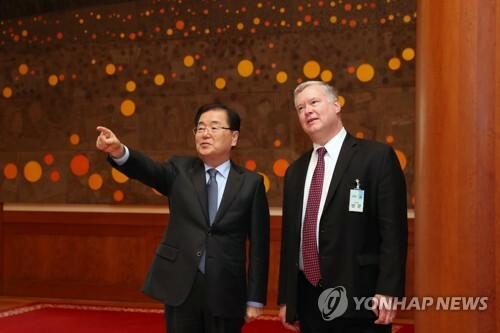 "As part of that, the two governments agreed on establishing a new working group that would further strengthen our close coordination on our diplomacy, on our denuclearization efforts, on sanctions implementation and inter-Korean cooperation that comply with United Nations sanctions," the spokesperson said during a press briefing. "So this is an additional step that we're taking that Special Representative Biegun and his team will be leading," he added, declining to provide details on who will make up the two sides of the working group. The two Koreas have held three summits this year with a focus on reducing tensions between the sides and laying the groundwork for denuclearization negotiations between Washington and Pyongyang. U.S. President Donald Trump and North Korean leader Kim Jong-un met in Singapore in June in the first-ever summit between the nations. They came away with an agreement to work toward "complete" denuclearization of the Korean Peninsula in exchange for security guarantees from the U.S., but progress on the deal has appeared slow. Trump and Kim are expected to hold a second summit early next year.